CL 2.0 is on. Today is 55F and the long term forecast is peachy. We are polishing up the final routes but it looks something like this. Meeting point daily at Starbucks, 1091 N Bluff St # 401, St George. Day 1 meet 10 am. Same route as last year. About 5-6 hours if you go the whole way. 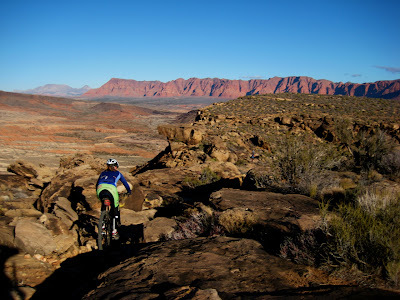 Out and back up along Powerline, Church Rocks, Prospector and Silver Reef. There is a water spigot at Red Cliffs we pass twice doing the out and back. Last year this day was supposed to be a loop but we chopped it into an out and back (which is actually longer than doing a loop!) because of an impassable mucky road at the high point. It turned out the out and back was really fun cause we got to see everyone and do some regrouping on the way back. So we are keeping it that way. Day 3 meet 8am - that's right I will drag myself out of bed early and be on time this year I promise. This is the big fat Queen stage. A hundie - well close, it maps out to 104 miles in Topofusion. This is a big bad route heading from town out to the Arizona Strip. If you haven't ranged far out there this is your chance. On the way we will do an out and back jog up to the top of Starvation Point to see the Virgin River Gorge views cause they are gorgeous. After Starvation Point the route looks like a figure 8 so you can easily short cut. We will pass Coyote Spring. You can filter water here. I think it tastes bad, kinda limey but Dave thinks it tastes fine. There are several short cuts on this route. The whole route at a good clip I'm guessing will come out in the 8-9 hour range. Hence the early start this day. It starts downhill so will be chilly. Bring your ear muffs for this start. It may be in the 20-30F's. Goatheads are EVERYWHERE here. You will not survive an hour at Camp unless you have tubeless tires filled with fresh Stans sealant or slime tubes. Carry 2 tubes with you too! Be warned, they are everywhere... Stans disappears so crack open your tires and pour some fresh stuff in there before Camp. We will post gps files of the routes later. Best hotel locations? Anything on St George Blvd or Bluff St is good. What else? Post questions here. Time to peer into Topofusion and see what comes out of it's crystal ball. OK, that and looking around to see where it isn't white. The AZ strip looks fairly covered with white from my place - but that's looking S towards N facing slopes. It's merely an illusion. If it's flat and below 4k' it's probably snow-free and maybe even dry. So, this new route. It's a beauty and features a rolling 1000' climb overlooking the Virgin River gorge. It was a fine route for rolling the SS. I kept asking myself what had kept me from riding here before? We've talked about it for a few years. Meanwhile, LW has a snack attack like none other at the top. She just can't seem to eat enough. What is up with that? Rolling down the climb it dawns on her: we were sitting atop Starvation Point. Here's something to look forward to in Camp Lynda and don't forget the snacks! We've been getting a lot of emails asking how the trails are holding up to the relentless round of storms rolling through. If the camp was this weekend we'd be in trouble - next weekend it would likely be good to go based on the 7 day forecast (sunny and 50's). Yesterday we even ran into muck on Prospector trail (just north of Church Rocks). That opened the door for riding the Bracken's loop, a trail that I never considered would be rideable. OK it wasn't for the most part, but lots of it was frozen sand full of deep horse prints. Fun in a bizarre way...and killer scenery. The bottom line is we just don't know what conditions will be like in a month. They can improve - or deteriorate - quickly around here. A week of good weather and everything under 4k' will likely be good to go. We will call it the week before the camp. What we really don't want is to invite y'all here from all over the country and then ask you not to ride vulnerable trails when you get here. Rant: The trails are kinda rideable when they are wet with a lot of slipping around and churning up the clay and dirt. This kind of riding is fun once in a while but trashes the trail, sometimes beyond repair. It is super tiresome to hear out of town folks say "I drove 400 miles to be here so I was gonna ride..." Then they go home with a mucky bike and we are left with crappy trails. That is so common. We do stay off the trails when they are mucky. We are riding the road today. CL v1.0 vets will recall the windy Blakes climb of day 2. I'd estimate 2+ feet of snow up there right now. (!) We won't be riding Blakes, or Jem, or Gooseberry - those areas all got pretty hammered. Still a lot of options if the weather cooperates. Stay tuned. It's a quick bailout from the top. After several hours of riding, 56 min and 2k' descending brought us to the much anticipated fridge. It really was a day of saying wow and eating ETE grins. We didn't quite hit the intended high point of the ride so looks like we'll have to go back. Awe shucks. I thought I'd change the name to 2-Epic camp cause it is as much Dave's party as mine but the CL moniker has stuck it seems so we'll roll on. Adam called this next version coming up Camp Lynda 2.0 - I like that! The date is firm. Jan 23-25. This is three weeks prior to Old Pueblo, Susitna 100 and Mas or Menos so whatever your valentines day race agenda is you can taper after Camp Lynda. The format is firm too. Same as last year. Self supported, no entry fee, no t-shirt, follow a gps route, bring your own tools and snacks and take a shortcut home when you have reached your fun threshold. Fitness and ability level are non-issues. You set your own pace. Courses are not firm. If the weather stays dry we will go high. Maybe all the way up to the Cedar Pockets overlook. If it is wet or snowy up high we'll stay low on the sand and slickrock terrain. The Saturday route is gonna be a local single-track smorgasbord including Barrel Roll, Rim Rock, Stucki, Bear Claw, Zen, GV race course and Barrel Cacti - about a 55 mile route with many bailout points and loads of fun trail. Friday and Sunday are still under debate but one day will be a tour out in the AZ strip area and another day is likely to be Jem/Gooseberry. By far the best part of Camp Lynda V1.0 was the characters that came. People who love to ride their bikes.